On October 7 at the “Bundespressekonferenz” in Berlin, we present the results of the first major survey amongst Syrian refugees in Germany. In the past two weeks, we surveyed nearly 900 Syrian refugees why they have fled and under what conditions they could imagine to return to Syria. Here you find the background for questioning and the main results. The arrival of tens of thousands of Syrian refugees has reignited the debate about the causes of this migration and raised questions about European foreign policy toward Syria. Until now the debate has largely been about Syrian refugees, with little space for the refugees’ opinion. This first comprehensive survey amongst Syrian refugees in Germany is an attempt to fill this gap. Respondents were asked why they fled and their plans for the future. The survey is structured along these broad lines: first, questions related to the reasons that led to them fleeing and, second, questions concerning conditions required for individuals not to need to flee or possibly even return. Furthermore, the survey tested respondents’ attitudes to international foreign policy towards Syria. 1. Refugees are fleeing from immediate threats to their life. By far the most cited cause of individuals fleeing was fear of physical harm. Economic motivations or a desire to obtain a European passport play hardly no role. 2. The violence of the Assat regime is the main cause of the refugee crisis. Respondents named the violent conflict (92%), the fear of being arrested or taken hostage (86%), as well as barrel bombs (73%) as direct threats to their life. Responsibility for these causes can be directly assigned to the government of Bashar al-Assad. 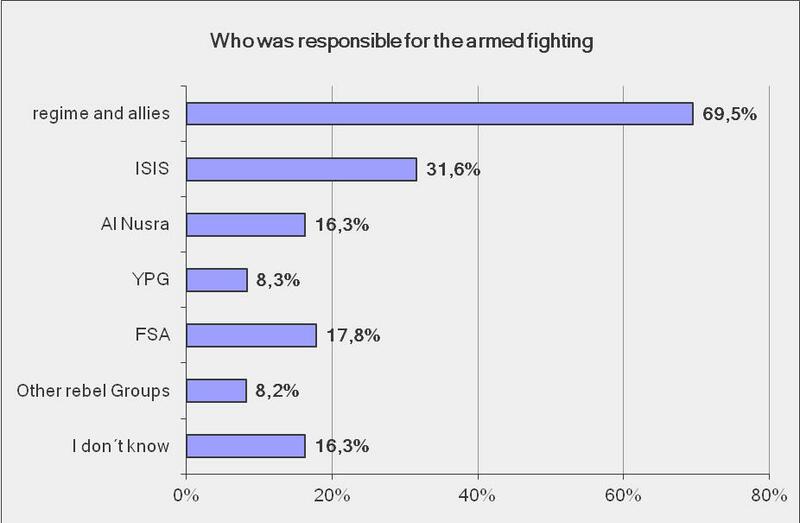 More than two thirds indicate that the Assad army and their allies were responsible for violent conflict, less than half that figure name the so-called “Islamic State“ (ISIS). The Assad regime is by far the actor which inspires most fear of arrest or being taken hostage (77%), followed by ISIS with 42%. Since only the Syrian Army uses barrel bombs, this cause can also be traced to the Assad regime. Other armed groups were held responsible by less than 20% of respondents for arrests and hostage-taking. 3. More than half the respondents would only return to a Syria without Assad, a small minority (8%) wish to remain indefinitely. For 52% the departure of Bashar al-Assad is a precondition for their return, significantly more than the departure of ISIS (44%). The alternative apparently is democracy, since for 42% free elections are a condition for their return to Syria. The more abstract condition that “the war has to stop” was the most favoured option. 4. A majority favours no-fly zones as the most effective means of reducing further the exodus. Asked about the policy options available to the EU and international community to stem the flow of refugees from Syria, 58% demand the creation of a no-fly zone. Further options cited were the end of all arms sales to armed groups in Syria (38%) and more humanitarian aid, which 24% thought would effectively prevent emigration. A majority of respondents fled Syria in 2015 (65%), smaller numbers came in 2013 (12%), 2014 (10%) and 2012 (7%). A large majority were male (88%), the largest age group was aged 16-25 years (45%). The proportion of older age groups was smaller – 26-35 years (34%), 36-45 years (15%), 46-55 years (6%). A majority had no children (61%). The randomly chosen respondents came from all Syrian provinces. The survey was carried out from 24.9.-2.10.2015. We interviewed 889 Syrians living in Germany using a standardized questionnaire. Interviews were held in 12 centers housing arriving refugees, other refugee housing and refugee registration points in Berlin, Hanover, Bremen, Leipzig and Eisenhüttenstadt. At the time of the survey, no representative demographic information (proportion female/male, age et.) was available for the population in question. Surveyed individuals were interviewed in locations that are frequented by all refugee groups independent of political opinions and social characteristics. This is the case in particular of registration points and refugee housing to which refugees are allocated. Furthermore, the data was collected in five towns, avoiding selection effects due to location choices of different refugee groups. Surveyed individuals were approached upon entering or leaving registration centers and refugee housing. All self-declared Syrians were asked to participate in the survey. Given the survey methodology and lack of data, results are not necessarily representative of the population of Syrians in Germany and care should thus be taken in interpreting the results. A combination of face-to-face interviews and response using computer-assisted self-completion of questionnaires using tablet computers (CAPI) was used. First, this ensured respondents’ confidence in the anonymity of the survey. Second, this allowed for the inclusion of illiterate respondents in the survey. Questions were selected in cooperation with experts of the current situation in Syria and translated into Arabic by specialists. The survey was carried out by 18 Syrian nationals. Adopt a Revolution was aided in conception implementation and evaluation of results by Heiko Giebler, social scientist at the Centre of Social Science Berlin (WZB), department for Democracy and Democratization. The survey was conducted by Adopt a Revolution in Cooperation with The Syria Campaign and Planet Syria with scientific consultation by Heiko Giebler of Wissenschaftszentrum Berlin für Sozialforschung (WZB).